Parents will be able to ask questions during the meeting, talk one-on-one with district leadership, submit questions electronically at computer stations on site, email questions in advance to SpecialEducation@HoustonISD.org, or submit questions through an online form at HoustonISD.org/SpecialEducation. Parents can also ask their child’s school for a special education comment card, fill it out, and return it to the school’s front office. Hundreds of parents attended the first two meetings, hosted by the HISD Office of Special Education Services, which supports students with disabilities in gaining college and career readiness and independent-living skills through active engagement in grade-level curriculum. This entry was posted in News, Special Education, Special events and tagged special education on April 6, 2017 by HISD Communications. This entry was posted in News, Special Education and tagged records, special education on November 19, 2015 by HISD Communications. This June, HISD is teaching young people to be part of a community beyond the classroom. This entry was posted in College Readiness, High Schools, Special Education, Summer programs and tagged special education, summer social skills enrichment program on June 24, 2015 by HISD Communications. This entry was posted in District IX - Wanda Adams, Special Education and tagged Halpin Early Childhood Center, special education, Wanda Adams on June 3, 2015 by HISD Communications. This entry was posted in Special Education and tagged autism, hobby, special education on December 10, 2014 by HISD Communications. Special education teachers gathered across HISD to train, network, and share ideas as they prepare for the new school year. The training on August 15, called Job-Alike, brings together participants with similar roles at various campuses. It’s all part of efforts by the Office of Special Education to strengthen services to the district’s nearly 16,000 special-education students. This entry was posted in Special Education and tagged Briargrove ES, special education on August 19, 2013 by HISD Communications. Students perform an original song as part of the Westside Integrated Theatre's semester-ending play. In Aesop’s Fable, “The Bundle of Sticks,” a man teaches the importance of unity and strength to his sons by having them each break individual sticks rather than failing to break a bundle of sticks. 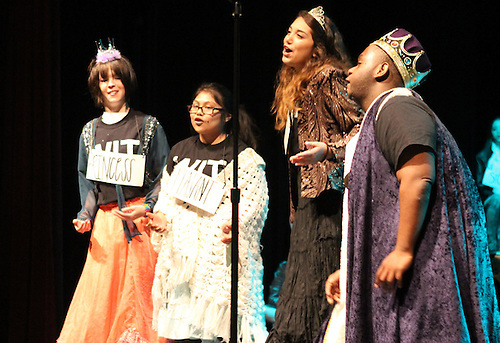 On Tuesday morning at Westside High School, the students of the Westside Integrated Theatre displayed their own unity and collective strength on stage, performing their own interpretations of the tales credited to the ancient Greek storyteller. This entry was posted in High Schools, Special Education and tagged special education, Westside HS on June 5, 2013 by HISD Communications. The Houston Independent School District’s Office of Special Education Services (OSES) would like to invite parents to the final meeting for the current school year on Wednesday, May 22, 2013. Parents will have the opportunity to share their ideas, successes and challenges, and learn about all the great initiatives the OSES has implemented this year to support students. The event will take place in Room 3C10 of the Hattie Mae White Educational Support Center (4400 W. 18th St.) from 11:30 a.m. until 1:30 p.m.
For more information, please contact Gregory Finora, Special Education parent liaison, at 713-556-7041 or gfinora@houstonisd.org. This entry was posted in Special Education and tagged special education on May 17, 2013 by HISD Communications. HISD currently has openings for motivated teachers who are invested in making an impact on student achievement. To attract the best candidates, we are currently accepting early applications for the 2013-2014 school year. The deadline for the early application round is March 18, 2013. We are continuing to access applications for the 2012-2013 school year. While vacancies exist in all areas, the highest need for teachers exists in critical shortage areas including bilingual (Spanish), secondary Spanish, secondary math, secondary science and specific areas in special education. To get started, click here and follow the directions to start your application for employment with HISD today! Candidates who apply early will have the best chance of securing contracts for the 2013-2014 school year. For more information about a teaching career at HISD, visit the teacher recruitment page by clicking here. This entry was posted in Bilingual, Middle Schools, News, Parents, Science, Special Education, Teachers and tagged 2012-2013 school year, 2013-2014 school year, bilingual, employment, hiring, secondary math, secondary science, special education, teacher recruitment, Team HISD on March 6, 2013 by HISD Communications.